October 11, 2017 — “So what are we doing this weekend?” That was Lindsey. I offered the choice in jest. 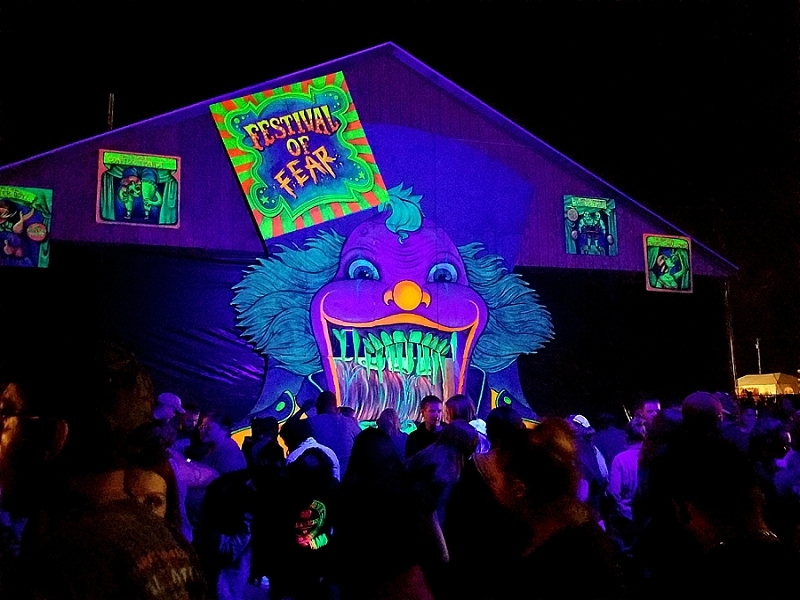 Nightmare New England is a haunted attraction. Lindsey hates haunted attractions. She chose the haunted attraction. 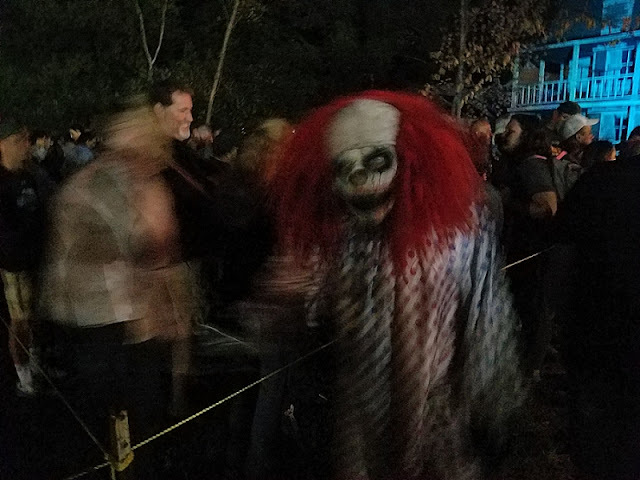 Nightmare New England (also called Spooky World due to some trademarks changing hands over the years) is in Litchfield, New Hampshire and features five different outdoor haunts. We visited it many, many years ago. Like when we first came to New England. It was a miserable experience. We visited in late October, which meant massive crowds and extremely cold weather. Standing in line was an eternity in the Arctic. We only made it through two of the five haunts before going home. 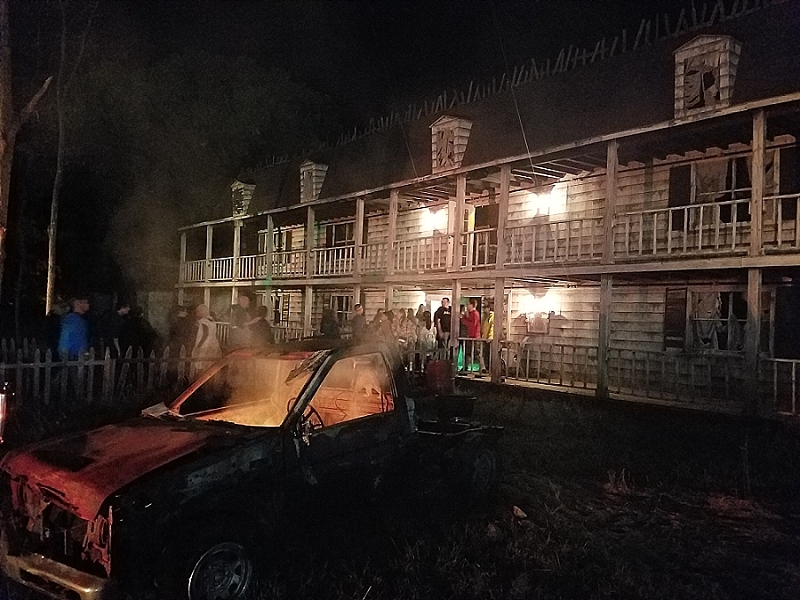 The only reason it was on our calendar this year was that it opened a week before any other haunted attractions in the area, and it isn’t easy to fill a calendar in mid-September with Halloween events. It also goes on a week longer than any other attraction in the area. 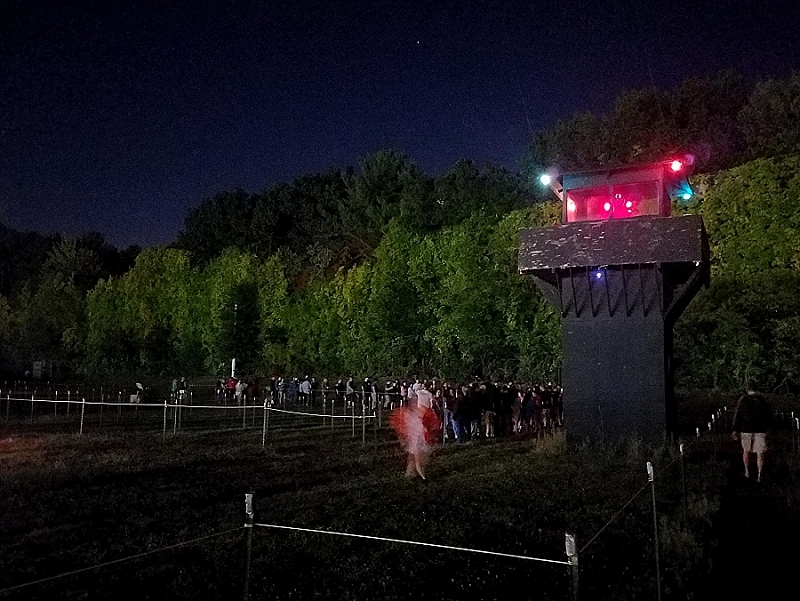 On the first weekend of November, they just shut off all the lights in the mazes, give visitors glow sticks, and wish them luck in surviving. Since it was mid-September, the weather was right. And, since it was mid-September, I also figured the crowds would be right. However, as we pulled into the small town, we found a chaos of cars and people and parking lots—we actually parked in somebody’s front yard because the mad loot from the parking fees was worth killing the grass over for the homeowners. 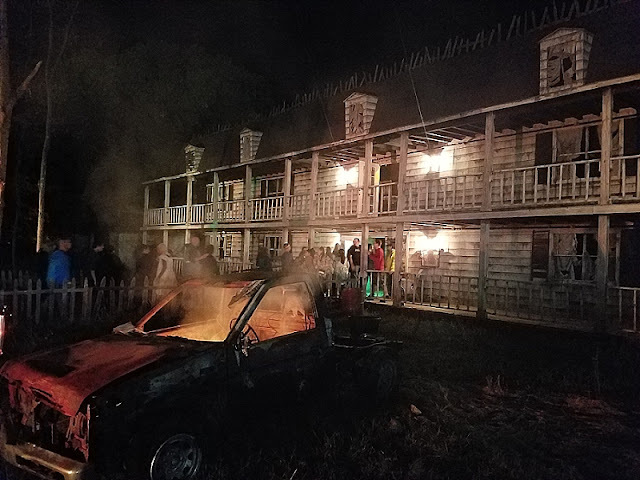 Once we got into the thick of things—the chainsaw roaring, the people screaming, the smell of bonfires and trampled grass filling the night air—the crowds weren’t too bad. In fact, they’d cordoned off the lines for the five attractions, and those cordons extended a good 50% further than the end of the actual lines of people. Yeah, late October there will be a madhouse. But the VIP tickets meant we had a separate, faster line. And that made all the difference. The first haunt we entered was Brigham Manor. It had a glorious façade, like an old, abandoned mansion. However, inside, it was kind of par for the haunt course. Nothing too immersive. But then we did the Haunted Hayride. This was, by far, my favorite attraction. 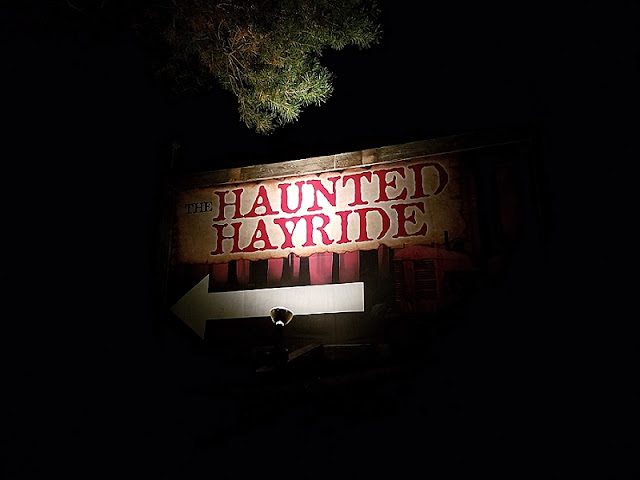 The scares weren’t intense (they rarely are with haunted hayrides—something about just sitting in a wagon feels both passive and protected), even with the haunters jumping into the wagon and it being the one haunt where they were allowed to touch you. But the atmosphere and variety and length of the attraction is exactly what I want out of a haunt. It felt like it went for 20 minutes, and we passed into a forest far away from the other haunts and through some amazing environments. There was an entire village built above us into the trees, an old barn full of giant mechanical spiders and webs (complete with living victims enmeshed in them). A plane crash site erupted in a surprising explosion. I even saw the best use of those stupid green-dot projection systems that people aim at their houses come Christmas. The hay ride used a series of these to create a surreal section of light trees that was simple and effective. 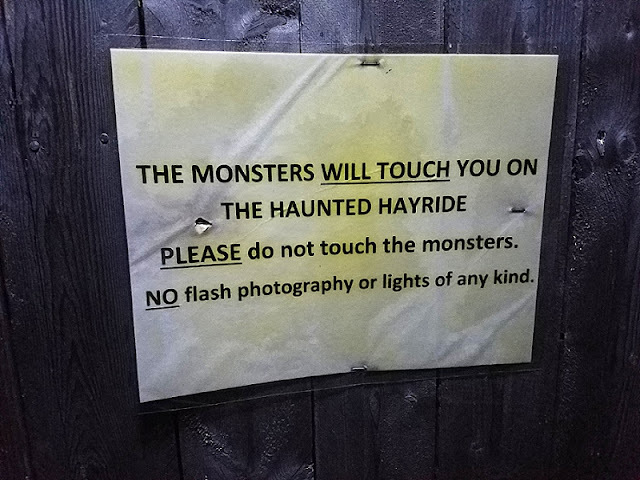 Again, this is what I want from haunt attractions. I’m not really scared by them, nor am I really looking to be. I just want to be immersed in a world of dark wonder. After that came The Colony, which was basically a riff on a red neck outpost or something. This was the best actual haunted attraction if you factor in scares and effects and atmosphere. The track wandered in and out of buildings and the actors all really got their roles. My favorite effect was a green laser device and fog machines that created a horizontal surface at about torso level. Below that surface, you couldn’t see anything. Which meant as you waded through that fog, you didn’t where somebody was going to pop up. Most important, after the scare, they simple disappeared back into the laser surface and fog, skipping out on the whole “Whoa, you startled me, but I know you’re just some random kid in makeup and now it’s awkward because you’re staying in character and I just want to get past you to the next part of the maze but I’m kind of hemmed in by other visitors” bit. After that maze was another called Carnage, which I guess was an old junkyard. 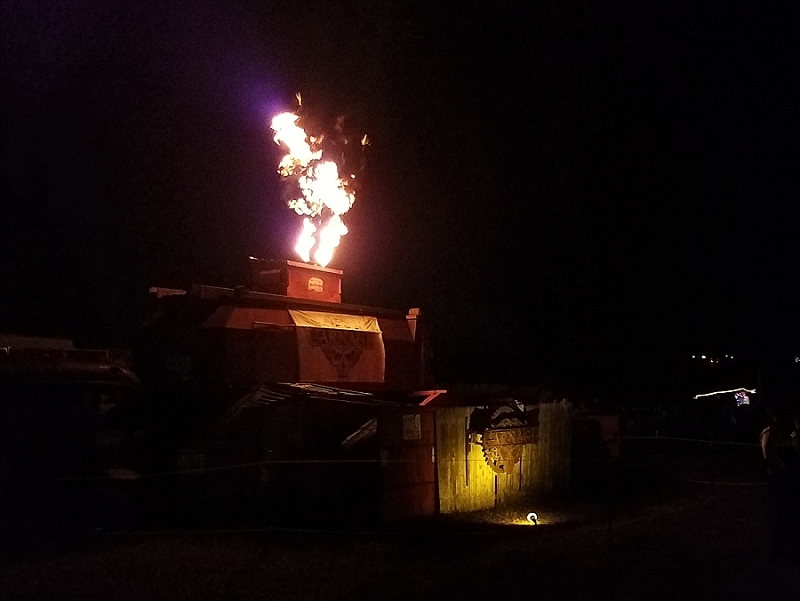 This haunt was really noticeable from the midway because every once in a while a giant column of fire erupted above it almost heating and lighting the entire field. This one had some cool setups, but not very many scares. It was most notable for the claustrophobia tunnel, where you had to push your way between two large, suffocating bladders for a long distance. The girl behind me was so panicked I think I still have crescent-moon-shaped indentations in my back from her fingernails. It’s a really effective little set piece. Although to me, the bubbling panic didn’t come from the claustrophobia itself, but from the certain knowledge that anybody in front of me could panic and freeze or freak-out and then everybody behind me would keep going and I'd be trapped and squashed and pinned and have to disappear into that part of my mind where my psychiatrist tells me I'm not supposed to go, and not emerging until 30 years later in a hospital bed surrounded by my grandchildren. "The Tunnel," would be my first words to them. And then we did a 3D clown maze. There are a lot of these around, so they’re another one that’s kind of par for the haunt course. Although that black-lit purple façade really stood out nicely in the darkness on the midway, adding to the ambiance. There were other activities to do there, of course, food and drink, carnival games and a zombie paintball firing range. For us, in between haunts, we mostly just watched as girls raced away from the omnipresent chainsaw fiends, screaming and falling down like we were inside a badly written horror movie. Final score, we did all five haunts in 2.5 hours, and it was one of our best experiences at a multi-haunt because of exactly that. Even Lindsey had a good time, somehow. I mean, when she wasn't screaming, "Why do they always come after me?"